Do you want to get your work in front of more people? Push yourself creatively and write on the bleeding edge of interactive storytelling? Earn money writing? Don't miss out on the next contest announcement: Join the Expedition Quest Writers mailing list for writing inspiration and be the first to know about new contests! To celebrate our recent Kickstarter launch (and successful funding) we wanted to encourage our quest writers to take these new Expedition cards for a spin! Between the new Synth enemies, Skills, and Tech cards, this opens up a lot of possibilities for narration. 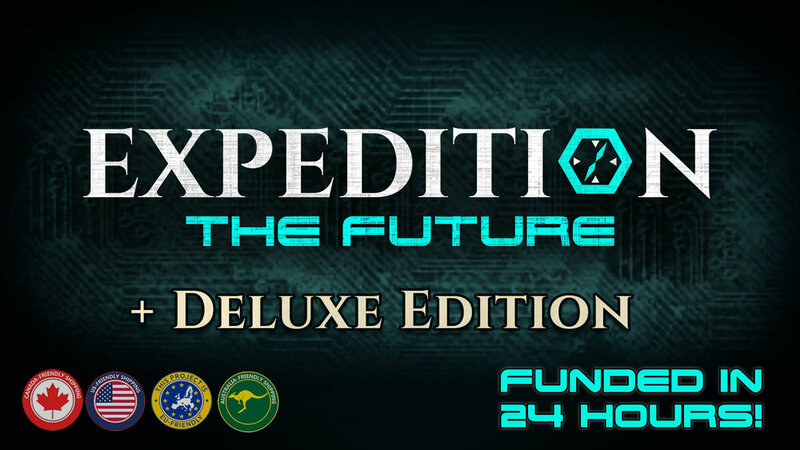 Any quest that gets published requiring the Expedition: The Future expansion between now and October 28th will be eligible to win this contest. The winner of this contest will receive a signed copy of the Deluxe Edition and 500 loot points! Your quest must be published by October 28th at midnight EST, and we’ll announce the winner on October 30th at 7:00 PM EST. You must write and publish a quest using the Expedition Quest Creator in English before the contest deadline. Quest must be accurately tagged with age level. Quests may not contain deeply offensive material, such as scenes that glorify sexual violence. Quests cannot infringe on other's intellectual property. Sorry, no Harry Potter fan fiction! For prizes of $25 - $599: You must report your prize earnings on your local tax form as "other income" (such as a 1099 in the US). Entrants in all countries are eligible for prizes under $600! For prizes of $600 or more: Only those residing in or paying taxes in the United States are currently eligible. You must be age 18 or older by the end of the contest. If you win, we'll need a W-9 from you before we can issue payment. Beguiling smiles go a long way for a bandit, and maybe they could even make a more honest career out of it? Thespians and Thieves features our dual-theme system, and the themes for this contest will be bandits and drama. In other words, we want to see you publish the best quest you can using bandit enemies, a drama-filled plot, or both if you're up for a challenge. This contest will run until September 30th at 11:59 (EST). The winner of Thespians and Thieves will earn 500 loot points. All entries will be rewarded with 100 points for using either theme, or 200 points upon using both. The term bandit can be a broad term, so take advantage of that! Maybe you want to write a story involving two powerful, rival families with star-crossed lovers that ends in tragedy? A thrilling fantasy tale, set on a continent full of family houses striving for political power and control of a throne? Or perhaps an adventure featuring a fedora-wearing archaeologist fighting against some nasty villains for a powerful artifact. Show us what you can come up with! To enter, we're going to ask you to fill out this Google Form with your name and quest title, which will allow us to filter through quests and pick a winner. Your quest must be in English to qualify, but we do encourage quests of all languages to be made for, it just takes us too long to translate in a reasonable time to make a ruling on a winner. Finally, make sure your quests are marked for your audience accordingly, anything offensive will be taken down and the entrant disqualified. To celebrate the various graduations and school getting out, we figured it'd be a good time to introduce our new contest, Adventures in Academia. Keeping with our dual-theme contest, we wanted to kick it up a notch this month to really give our authors some creative freedom. We want to see the best quests you can write in an educational/academic institute of some variety, and then show your best progression through story-telling, mechanics, or otherwise. If you're up for a challenge, try using both themes. The winner will receive 500 loot points! Each entry using Fae monsters or mystery themes will gain 100 loot points. If you use both themes, you'll be rewarded with 200 loot points! To enter, write and publish a quest (in English) with the Expedition Quest Creator by 11:59pm EST June 29th, 2018. Then, fill out this form with your author name and entry title. The Expedition team will select a winner shortly after. If you want to read more about the contest, check out our blog post. Expedition has an audience of all ages, so make sure to mark your quests accordingly. Anything offensive or pornographic will be taken down and the entrant disqualified. The turnout for our previous contest, Language of Lovecraft, was phenomenal! We loved the concept of introducing two themes for the authors to pick from and rewarding all entries. We want to see your best quests using Fae monsters, mystery themes, or both if you're up for a challenge. To enter, write and publish a quest with the Expedition Quest Creator by 11:59pm EST on April 26th, 2018. The Expedition team will select a winner shortly after. Our latest expansion, Expedition: The Horror, has just launched! To celebrate, our writing contest of the month will have two themes. We want to see your best quests using the new horror monsters, romantic themes, or both if you're up for a challenge. To enter, write and publish a quest with the Expedition Quest Creator by 11:59pm EST on March 8th, 2018. The Expedition team will select a winner shortly after. Expedition has an audience of all ages, so make sure to mark your quests accordingly. Anything offensive or pornographic will be taken down and the entrant disqualified. We all love Cthulhu, but not like that. Need an excuse to practice your writing? Want to win $100? Then you've come to the right place! This January, the quest with the best out-of-combat roleplaying and character progression will win $100 in cash! To enter, simply write and publish a quest with the Expedition Quest Creator by 11:59pm EST on January 31st, 2018. After the deadline, the Expedition team will judge all entries and select a winner. Additional consideration will be given to quests that are 40 minutes or longer. November / December Contest: $500 Prize! November is traditionally National Novel Writing Month ("NaNoWriMo") - but instead of writing a novel, why not push yourself creatively and write an interactive story using the Expedition Quest Creator? This time around there are no theme constraints: write whatever story your heart desires, as long as you can fit it into the Expedition system. To keep to the spirit of NaNoWriMo, qualifying quests must contain a minimum of 15,000 words. You cannot start writing your quest until November 1st (though you may work on an outline ahead of time), and your quests(s) must be published publicly by 11:59pm EST on December 31st. Instead of publishing your quest as a single 3+ hour adventure, you may also choose to publish it as a multi-part quest series. If you publish in multiple parts, we encourage you to publish each part as soon as it's written so that you can get as much feedback as possible - just make sure that all of the parts are published before the deadline! There are also several ways to earn bonus points on top of the normal rewards! All authors who publish at least the first chapter of their entry by November 30th at 11:59pm will receive a bonus loot point. Every 5,000 additional words over the minimum also earns you an extra point. And if you incorporate a winter or holiday theme into your entry, you'll earn yet another point! This is our biggest contest to date, so if you have any questions, please email us at Authors@Fabricate.io! At the end of November, the Expedition team will select 5 finalists. The winner will be selected by audience vote over a two week voting period. At the end, whichever quest has the most votes wins! If there is a tie, the prize will be split among the winners. To celebrate the quickly-approaching Halloween, we're giving out bonus rewards to anyone who writes spooky and horror-themed quests! Every spooky / horror quest you publish earns you 2 Loot Points. If you're looking for writing inspiration, quests earn 1 additional Loot Point for incorporating the theme "The Monster with the Face of Man": Sometimes the most monstrous evil hides behind the banality of the mundane. And, if you're a first-time author, you'll earn an additional loot point! To qualify, quests must be at least 1,000 words, published publicly before midnight EST on October 31st, and follow Expedition community and quality standards.